Jorge Contreras, aka "Que Rico", has been recognized as one of the most versatile Bachata Instructors worldwide. Having mastered both "Dominican" and "Modern" styled forms of the dance, he continues to push the limit, breaking barriers and setting standards in the genre time and time again. His charismatic personality and overall energy have earned him much respect as an MC, Performer, and closest to his heart, as a highly acclaimed Director and Instructor. Jorge is of Mexican descent, but was born and raised in Santa Ana, California. Dance has always been a huge part of his life and his background includes mastery of various genres such as Jazz, Contemporary, Hip Hop, Salsa, Zouk, West Coast Swing and of course, Bachata! 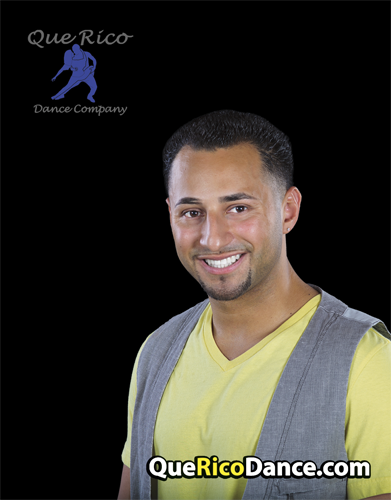 Jorge received his training at the World Famous "Millennium Dance Complex" in the heart of Hollywood, California. He continued his study of his most prized art form where it first originated; taking in the culture, music and dance of Bachata in Santo Domingo, Dominican Republic. Jorge has also had the honor of traveling to teach and perform all over the U.S. and internationally in Countries including, but not limited to: The Dominican Republic, France, Finland, Australia, Malaysia, Trinidad, Japan and Canada.